This is one of my favorite simple nail art designs as it reminds me of the etching crafts I use to do when I was younger when you would scratch away at the black to create your design and show the colour underneath. 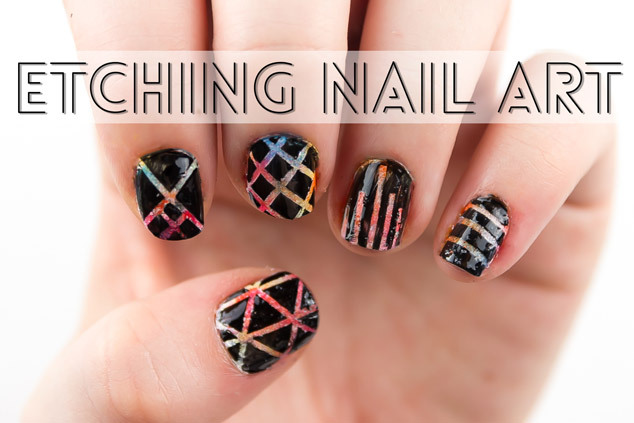 I love the black and the neon combination and it isn’t a very difficult nail art to do but is time consuming. If you are interested in seeing any of my other nail art you can find them here. The best thing about this set of simple nail art designs is that you get some great results with a relativity small amount of effort. All you need is some cheap nail stripping tape, make up sponges and your favourite nail polish. No drawing skills needed! Below I have put my list of tools and products that I used. You can do so many colour combinations with this design. I would love to see some of the attempts and styles that you guys come up with. If you could put them in the comments below for everyone to see that would be great. Please like the video and remember to subscribe! If there is any other simple nail art designs that you would like to see from me in the future leave it in the comments below. They will be a second post for Tecky Tuesday up tonight!